As you know, I travel a whole lot, and I have gotten a lot of feedback about traveling with only a carry-on, which is what I nearly always do – and you can do it too with this handy packing guide. 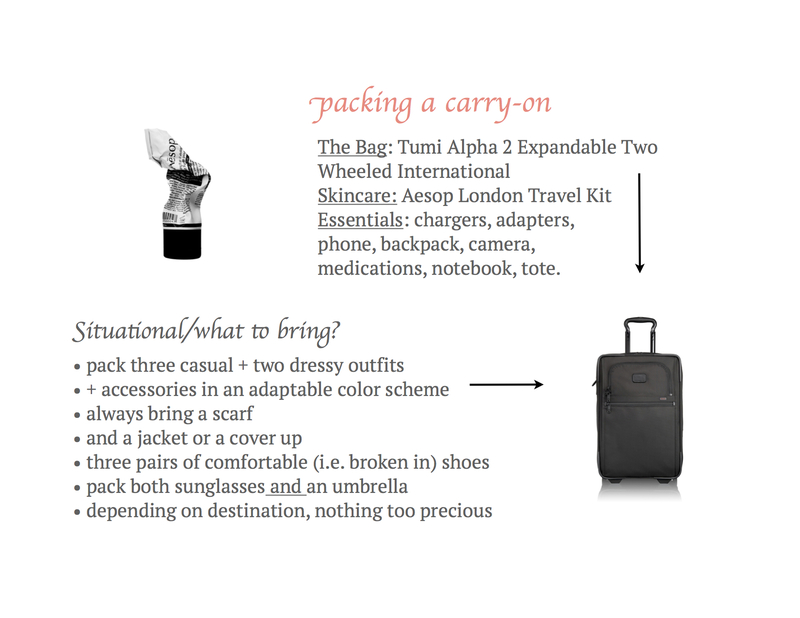 It all starts with my favorite bag: this Alpha 2 soft, expandable Tumi international carry-on. It is super durable and fits so much. 99% of the time I pack this as my only bag for all travel – whether it’s one week or three – and it fits in nearly all overhead compartments, not just on international flights (I have only had it not fit once on a small Swiss Air plane). I have converted my friends and family to this bag from some, perhaps, more “exciting” and fancier options because it is really just that great. Bonus: it goes on sale fairly often, particularly around the holidays. Tips: A two wheeled case makes for more space inside + Tumi offers free personalization for monograms and easier identification! Also, don’t forget to register your bag as it has a scan code inside, which also helps in case it is lost or misplaced. I also pack a “travel kit.” I have been loving the Aesop London travel kit that I recently reviewed on my Stories – there is just enough of everything for 1-1.5 weeks of travel, even a small muslin towel (they make smaller kits too). This makes it super easy to stay organized on and off the plane and offers enough space for your toothbrush and other personal items. Tip: make sure to also pick up a bottle of their great hand sanitizer. I pack shoes and books on the bottom of the bag, then roll soft clothes like t-shirts and organize the rest in dust bags. I find that this makes it much simpler to pack/unpack, live out of a suitcase, and organize laundry. Any questions? Let me know here or reach out on social media!